The Model 300 3 Season Sunroom by Connor Windows Doors and Sunrooms is a bright addition to any home or cottage. 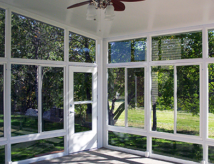 Made with 2” extruded insulated aluminum pillars with single glazed glass gives the 3 Season Sunroom strength, stability and a virtually maintenance free exterior. For seasonal use the Patio Room System is just right. High density 2″ foam panels and heavy gauge 2″ aluminum extrusions will make your favorite seasons last that much longer. Standard section width: min 32" - max 60"
Single slider lift out fixed windows available in White, Bronze & Driftwood -Standard window width: min 30" - max 58"